145.170 & 444.050 St Paul. DMR 442.050 Color Code 11 Repeater St Paul. located at the Bethesda Hospital. Elevation at the main site is 980 ft. The main antennas are 100' above ground at the Hospital. Here is a video of the surrounding area from the roof of the Hospital. 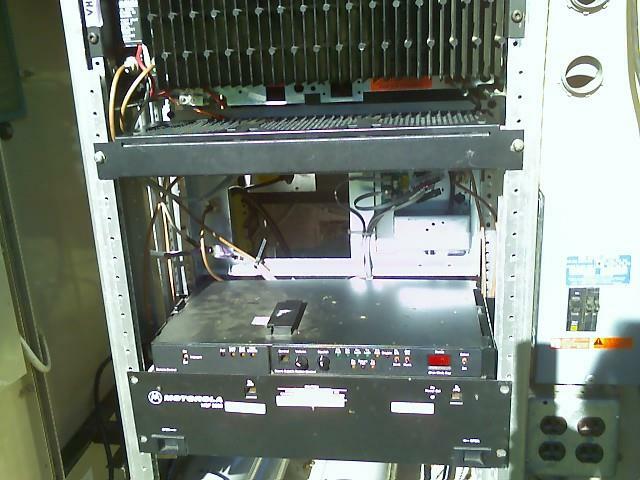 has installed on the 145.170 repeater. Hugo, Falcon Heights and ST. Paul are hooked up for now. 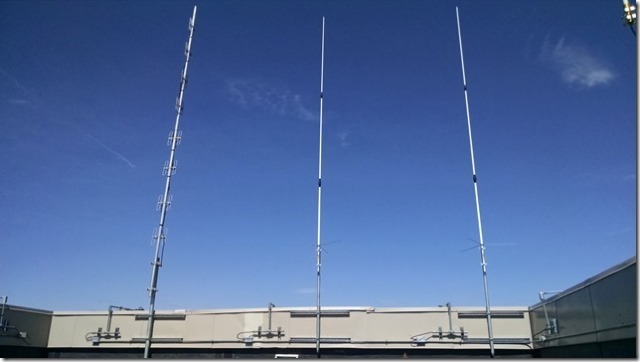 Pictures of the antennas on the roof of the Hospital. which had been used for the 444.050.
to the antenna. ( after the duplexers ). 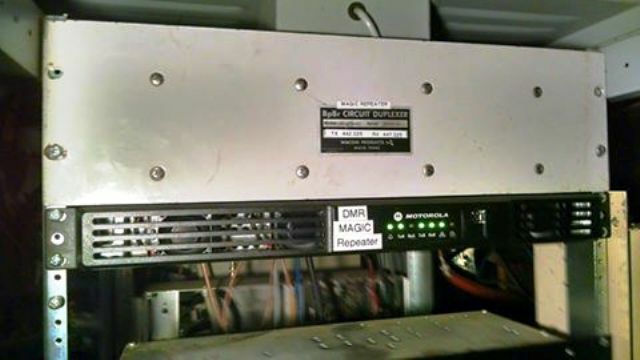 DMR Repeater is on 442.025 color code 11 code plug name STP. 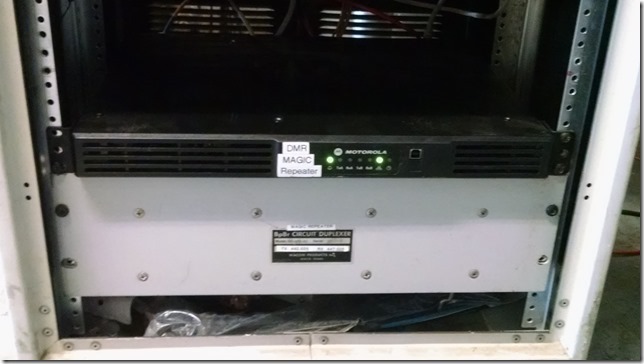 The MAGIC DMR Repeater on the air . 1/2" hardline with N-type connecters. 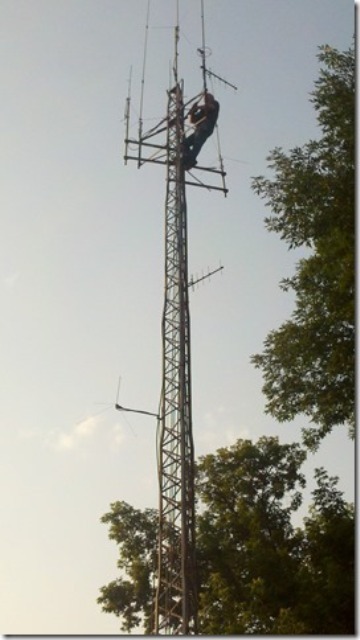 Here is the St. Paul DMR repeater at the new location. 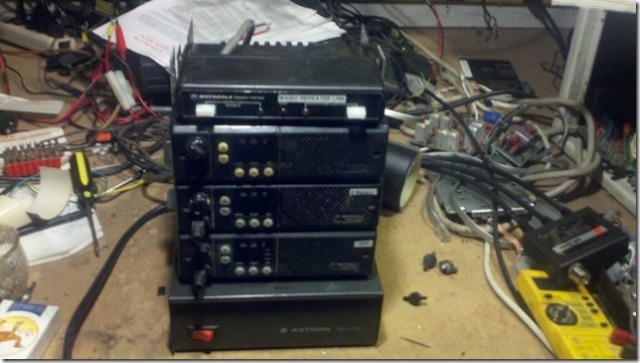 Here is a picture of the GP-9 used on the DMR repeater. While listening to the repeater I often hear the first time amateur asking questions like, how come I can hear the 145.170 mach. on 443.05 or what do you mean I'm going through the St. Paul Park site? 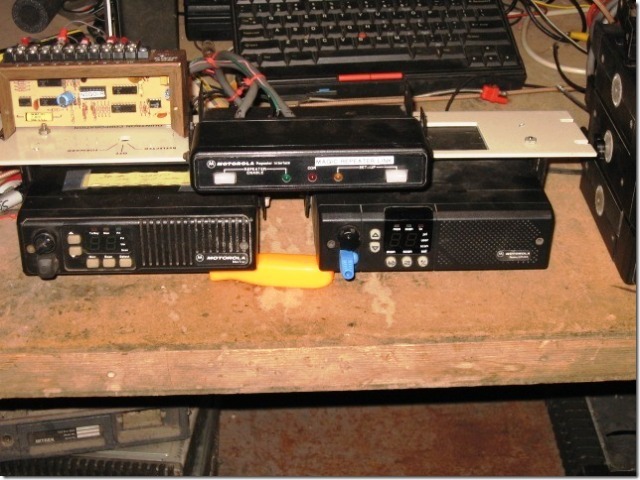 If your one of the newbie's to the magic repeater system or any VHF or UHF system your not alone. With all the new no-code techs entering the VHF an UHF bands I hear these questions every day. What ever your current license maybe or maybe your even a avid scanner listener, let me see if I can fill in some of these blanks for you. For an example if your in the Woodbury MN. 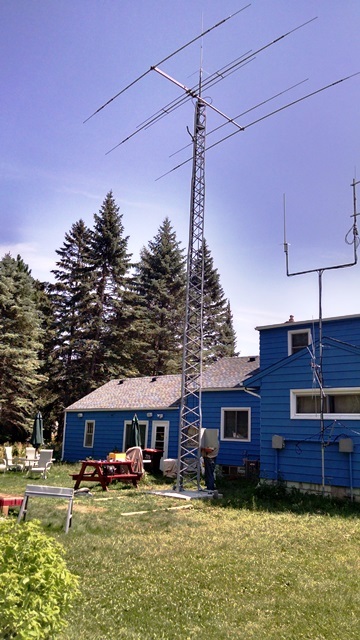 area and using the 145.170 MHz machine with a negative offset and a Pl tone of 100.0 your listening to the out put of the transmitter which is located in St. Paul, MN. When you transmit with the negative offset your transmitting on 144.570 MHz and may very well be getting into several receive sites. WHAT IS A RECEIVE SITE? A receive site and we have a few, is just what it sounds like. In short its another repeater that receives your signal as you transmit and then retransmits the signal. 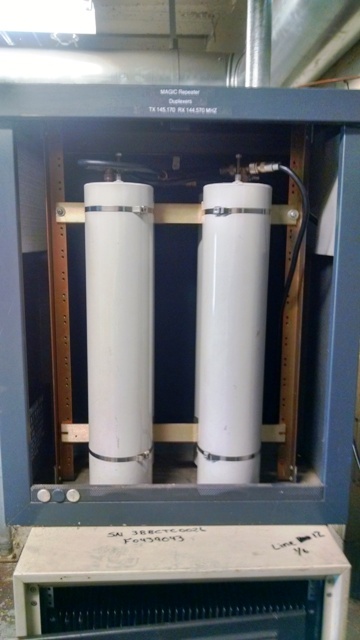 In the case of the magic system and the example above your signal is received and retransmitted on what we call a UHF LINK to the main transmitter in St. Paul. 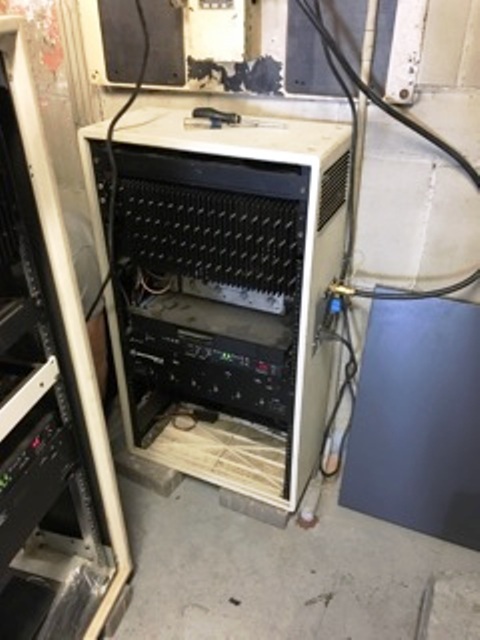 At the St. Paul main site there is of course a UHF receiver that grabs the signal and retransmits the signal out on 145.170 MHz. Now that is a simple explanation of what is going on when you transmit. There are a few other thing to keep in mind that are going on behind the scenes. 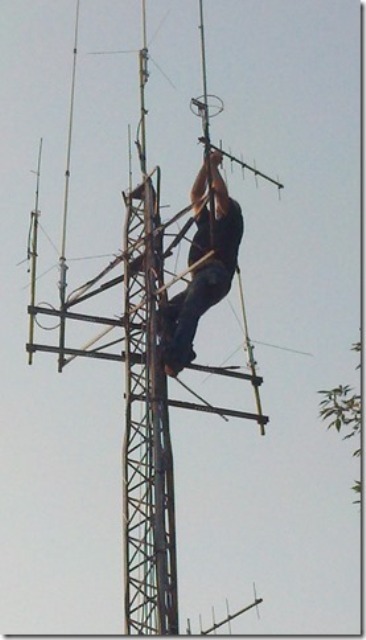 #1 the main site may also be transmitting your signal on another band such as UHF and our 443.050 machine. #2 You might be into several sites at the same time. That's where the voter comes into play. 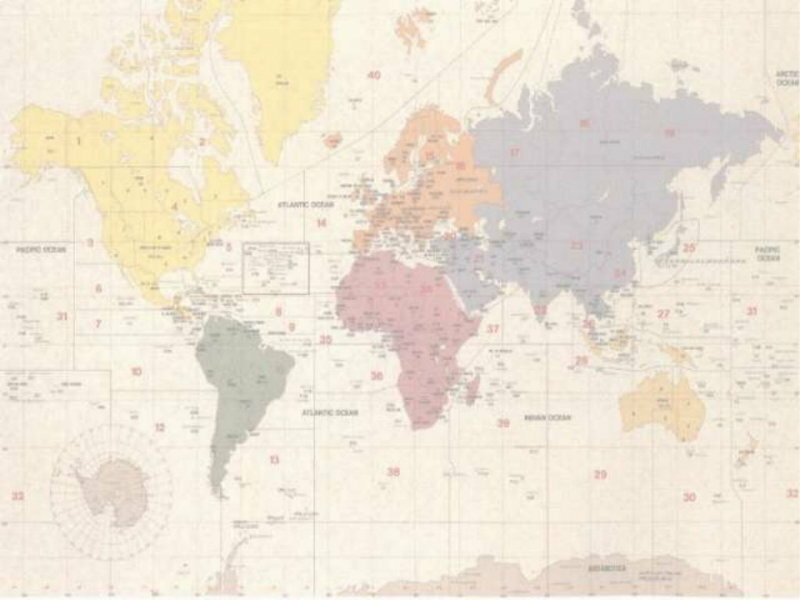 It receives your signal from the different sites and determines which sight your getting into best by comparing each signal from each sight and the noise levels coming from each of the sites. The voter then says "hay I'm getting a better signal from the Woodbury site than I am from the St. Paul sight so lets use the Woodbury signal" and then passes that signal through the system. in Hugo,Mn. went on the air on March 15 2014. 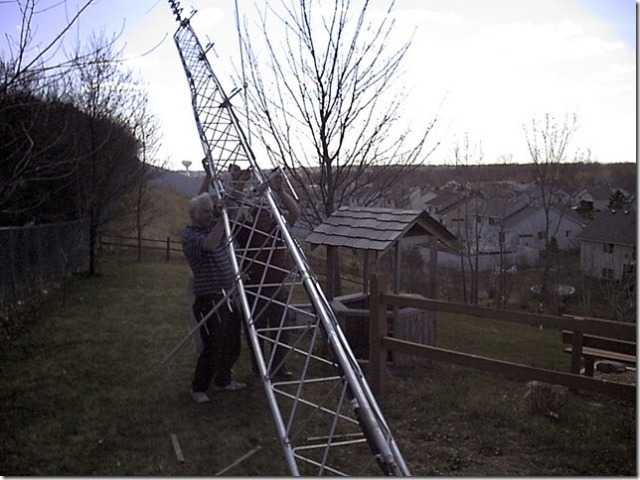 It is running 40 watts at the antenna. Here are some pictures of the repeater. and here it is on the 443.050.
for the 443.050 N0SBU/R in Hugo. 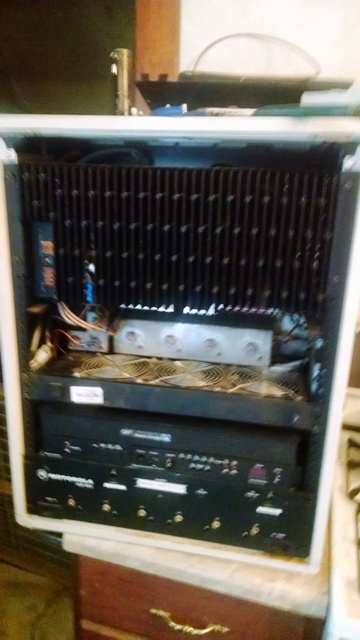 Here is a picture of the repeater. 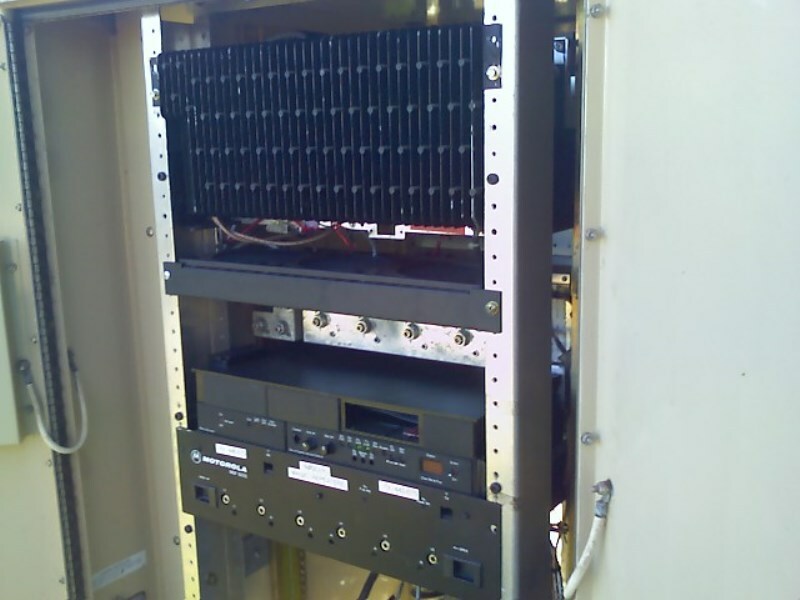 Here is a picture of the transmitter and receiver deck. 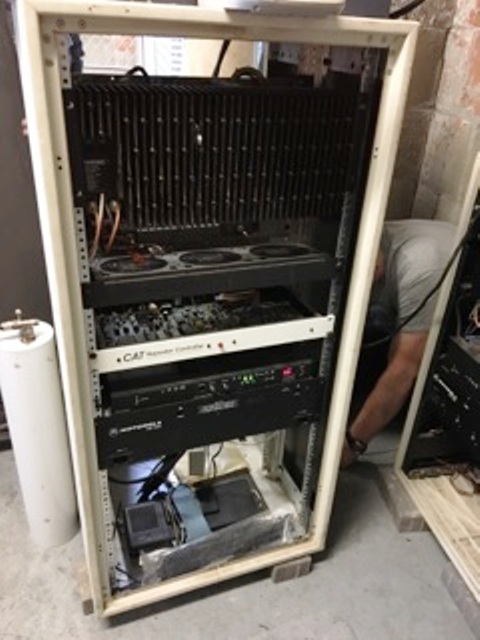 Here is the MSF 5000 installed into the rack cabinet. Here is the 145.170 receiver. up the 40' Rohn tower at NØSBU's QTH. where the antennas were before they went onto the tower. and an output of 60 watts. Foreston.146.745 N0GOI/R with a tone of 107.2. WELCOME TO THE KØGOI FORESTON MAGIC REPEATERS . "MINNESOTA AMATEUR GROUP OF INDEPENDENT COMMUNICATORS"
Her is a link to the Magic Repeater Home Page. that N0SBU George has put up for us. here please do let us know and we will be more then happy to try and work it in. Here are pictures of the new Motorola MSF equipment I just put in line at Foreston.
. Foreston 2 meter 146.745 / 146.145 Pl 107.2 NØGOI/R MSF 5000. Foreston UHF 443.675 / 448.675 Pl 114.8 NØGOI/R MSF 5000 Digital. 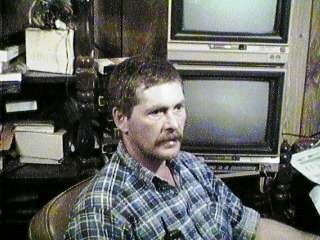 Give me a call on the repeater. 4 Falcon Heights Site Snelling Ave. @ Larpenteur Ave.
5-Maplewood East Site. LOCATION, just West of Hwy.120. 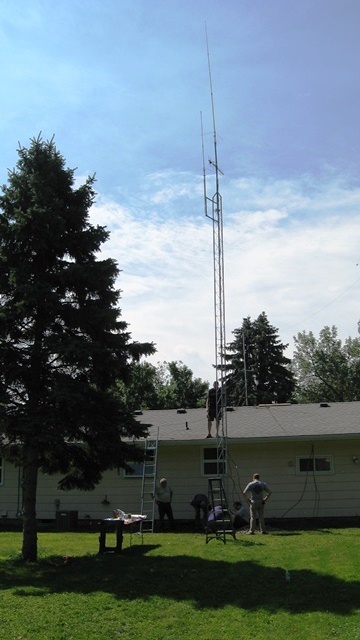 Here is a picture of the 40' HDBX tower with an Explorer 14 HF beam. On top of that is a 2 mtr/440 omni for the 145.170 reciever at this sight. Upper Left morse code cw-ider. Lower Right Motorola Radius GM300 UHF Repeater link. The unit is a Motorola GR400. The upper left is the Repeater Interface which is a HIM 3333B controller. The lower left is the 144.570 receiver which is a Motorola Max Trac. 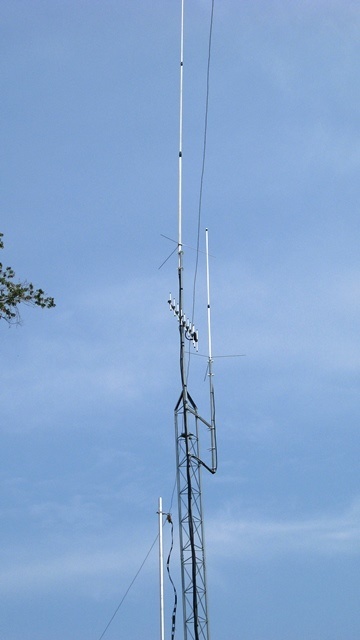 The lower right is the 440 link transmitter which is a Motorola Radius. LOCATION At Hwy. 61 and 141 St. No. on the link antenna for Hugo at the main site. The Magic Repeater would love to have you check into there Saturday night net. All are welcome to check in. The net is friendly general chat net with various topics. your net control. And we always have KA0NAN Marty with great announcements. Than we take checking's and at times we even have a topic to discuss. So don't be shy, come on by ,and say hi. From me and you and the MAGIC crew.